When I write about an LP I usually listen to it while writing. So yesterday I also listened to another song of Charly & His Explorers, Jezebel. 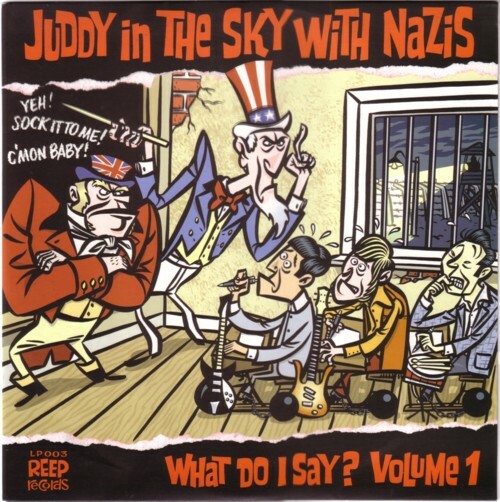 Suddenly I realised I had not yet written about Juddy in the sky with nazi’s !!! Of course most of the readers of this Soundtrack will already be familiar with this incredible compilation of non collectible rarities, but nevertheless: I wouldn’t like to find out that somebody has never heard of this LP. I was sure that the beautiful cover was done by Pieter Dorrenboom, but he has denied this till this very day. I still have my doubts, but he is one of the few friends that I have, so I don’t want to talk about this, if you don’t mind. The LP is a compilation of songs from all corners of the world. What links the songs is that the singers have no clue what they are singing. It sounds like English (although even that is sometimes a matter of debate) but it is something else, that is hard to describe. I remember playing the record for the first time and bursting out in fits of laughter. The people who made this LP make fun of the phonetical renditions of 60s hits that are compiled here. But it is clear that this is a labour of love. And I should not laugh about the way other people speak English; if I hadn’t a spelling control on my computer, you would have a hard time reading this Soundtrack. And these guys can play an instrument, which I cannot. So don’t laugh, sit back and close listen to the title track by the Romanian band Cvintetul Mamaia. I wish there would be more volumes made of this stuff, but so far I haven’t seen any. I LOVE this sort of thing! I laughed until I had tears in my eyes! I know the words to the original, so what I was hearing was hilarious! I absolutely love Cvintetul Mamaia and their distinctive sound. Thanks for sharing this with us!